Having a home office does not mean sacrificing the style, storage or comfort one has come to expect in the workplace. In fact, furniture enthusiasts can enjoy desks for their home office that deliver even more comfort, convenience and style than provided by traditional offices. And that’s what Dynamic Storage Meets Style: The Mannington Desk and Hutch is all about. An elegant design accents the Mannington Desk and Hutch. The style of the Mannington Desk first catches the eye. Notice the raised panels, graceful arches and beautiful, genuine woodgrain. However, the desk’s awesome storage potential is equally impressive. And in this department, the Amish builders did not disappoint. The builders included four drawers with dovetail joints for added strength. (Yes, there are four drawers – not seven. More on this in a minute.) Your keyboard rests in the keyboard drawer above the kneehole. Then to the right, you got a file drawer and two shallower drawers for your supplies. In the left pedestal, the builders hid some cool storage space behind three false drawers. There’s a pull-out storage shelf, storage shelves on the door, plus open cabinet space inside — for even more items. The hutch gives you even more storage. Like behind the two cabinet doors and on the open shelves. Also, the designers included a cork board under the hutch doors and a lighting system for added practicality and convenience. Great looks and dynamic storage are just part of what makes the Mannington Desk and Hutch special. What makes it unique is that skilled Amish cabinetmakers handcraft each unit from solid hardwoods. Like oak, cherry, maple and hickory. So you won’t find particle board, veneers, fiberboard, brands or nails anywhere. Also, the Amish men utilize traditional cabinetmaking methods handed down from their ancestors. As a result, with proper care, the desk and hutch should become a family heirloom. What’s more, you can order the unit as shown. Or, you can order it with your custom ideas, such as wood specie, hardware, finish and other options. 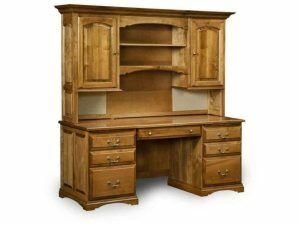 The Mannington Desk and Hutch is one of several such desks and related home office furniture available from Brandenberry Amish Furniture. To see it up close and personal, visit Brandenberry’s website. Or visit Brandenberry’s ‘brick and mortar’ store in picturesque Shipshewana, close to the 80/90 toll road in Northern Indiana.